This genuine Ruger® factory magazine with Ruger logo has been tested and has proven to feed as reliably as the standard BX-1™ 10-round Ruger® rotary magazine. BX-15® magazines will work with any factory original 10/22® Rifle, SR-22® Rifle, 22 Charger™ Pistol, .22 LR Ruger American Rimfire® Rifle and .22 LR Ruger 77/22® Rifle. 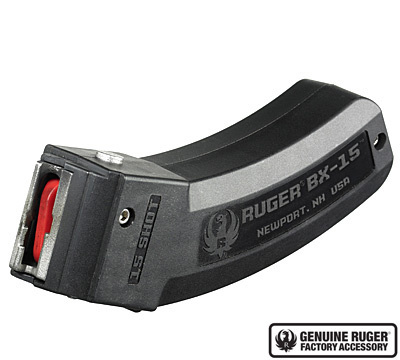 Ruger cannot bill to or ship 15-round magazines to the following states and cities: California, Connecticut, Hawaii, Maryland, Massachusetts, New York, Vermont, Washington DC. ILLINOIS: Cook County, Buffalo Grove, Dolton, Hazel Crest, Highland Park, Homewood, Melrose Park, and Oak Park. DO NOT ORDER THIS PRODUCT if you live in these locations. No problems with jamming and easy to load. I own 3 10/22s. I have, to date, 5 BX-15 magazines. all 5 work flawlessly in all 3 10/22s. Im reading reviews where these are causing malfunctions. This prompted me to write my own review. My short goal is 9 of these magazines, 3 each. Long term goal would be to have 20. I wouldnt keep buying the BX-15 if they didnt work. Im in the gun business. I work for a Major Handgun Manufacturer. There could be a boat load of reasons for a malfunction, might not be the magazine. Ruger puts out a quality product, if these magazines didnt work theyd damn sure fix them. Dont let someones review steer you away, be your own judge. Just bought a Ruger 10/22 take down rifle. Also bought 2 BX-15 mags. This evening I went to the range. The 10 shot mag worked perfectly. The first 15 round BX worked perfectly, the second 15 round BX failed to load rounds repeatedly. We tried that mag on another Ruger 10/22 and it failed repeatedly. Clearly, there is a problem. Im not quite sure what to do next. The 25 round mag is not legal in Colorado so it looks like Im stuck on 10 round mags. Very sad for Rugers rep. Also sad is that the way these comments are posted, none of my apostrophes are showing up in the preview! I made a conversion M-1 Carbine from my 10-22. To nearly authenticate the look I purchased the 15 round mag and took it to the range today....ran about 100 rounds through it without a flaw. Great mag for my10-22. No issues whatsoever. Ruger BX-15 Magazine is the best high capacity rimfire magazine I ever owned. I bought two BX-25-Magazines when they came available and found them strong and well made. No aftermarket 10/22 magazine is close to the quality of the BX. The BX-15 is handy and works better for shooting prone or from any shooting rest. They also fit easier in a pocket. Most failures to feed are failure of the person that loaded the magazine. If the rim of the top cartridge hooks behind the one below can cause feeding problems. Loaded properly these magazines are flawless. The only magazine better is the ten shot rotary 10/22 magazine. The BX-15 provides plenty of rounds if you don’t miss much. Bought one for my 10/22 and put about 500 rounds through it so far with no issues. Upon loading this magazine and TRYING to shoot with it, this isnt what you need if you really want to shoot without having Hang ups! I have tried 3-5 other magazines from Ruger and have had no problems. Buyers beware! If customizing a gun, better to try someone elses mags before buying for your gun, Nuff said. Bought this for my new 10 22 takedown rifle..Works great and easy to load. Actually buying another.